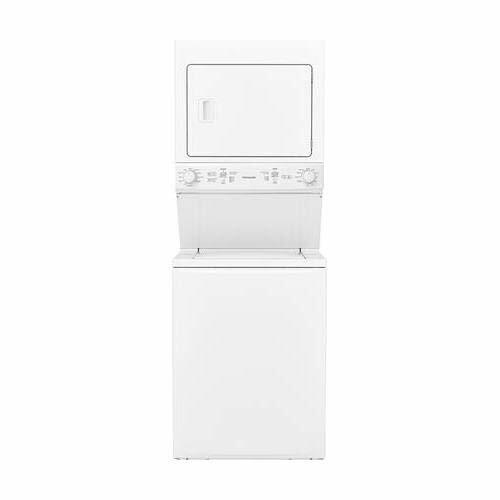 The Frigidaire Gas Washer/Dryer Laundry Center combines the largest capacity laundry center washer with a dryer conveniently stacked together to save space. The agitator in the washer gives you an excellent cleaning performance to ensure your clothes come out clean. With the MaxFill feature you have the option to use the maximum water level per cycle for the ultimate clean. Features 10 wash cycles to meet all of your washing needs such as Delicate, Activewear, Bulky and Colors. The dryer features 6 dry cycles to meet all of your drying needs such as Delicate, Activewear, Bulky and Air Fluff. Color: White. Last updated: April 18, 2019 at 11:29 EST. Pricing information is provided by the listed merchants. GoSale.com is not responsible for the accuracy of pricing information, product information or the images provided. Product prices and availability is subject to change. Any price and availability information displayed on amazon.com or other merchants at the time of purchase will apply to the purchase of the product. As always, be sure to visit the merchant's site to review and verify product information, price, and shipping costs. GoSale.com is not responsible for the content and opinions contained in customer submitted reviews. Coupon Details: Get $214.10 OFF automatically when you add this item to your cart! Regular price of $1343.10 will be shown prior to adding it to your cart.